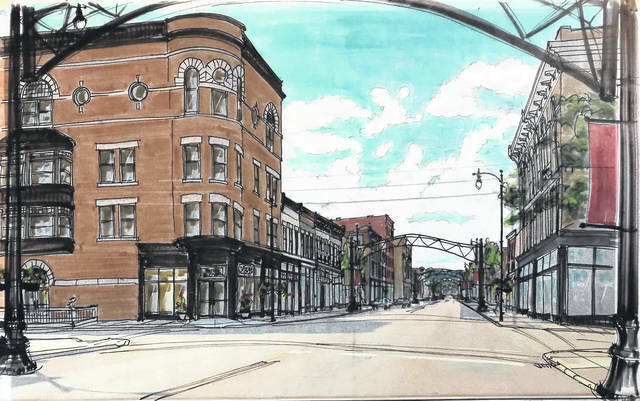 Local graphics artist Gina Chavat created these renderings of improvements planned for downtown Portsmouth. A temporary space-age skating rink, a huge Christmas tree, lots and lots of decorations including lighted arches over the street, new retail and 2,000 Christmas carolers. Does the above sound like plans for the upcoming holidays in Cleveland or maybe Columbus? Perhaps Cincinnati? The owner of Patties and Pints and other downtown developments has big plans for Christmas 2018. What’s been dubbed “Winterfest” will run throughout the month of December. Wolfe said his biggest scheme will follow in the wake of the Plant Portsmouth event which saw volunteers cleaning up streets downtown but also setting a world’s record for the greatest number of people potting plants at one time. Wolfe wants to set another record, this time for the largest number of people Christmas caroling. According to Wolfe, the current record is 1,822 set in 2013 in the town of Waukesha, Wisc., which sits in the Milwaukee metro area. Wolfe wants to raise the record to at least 2,000 people. No date is set for the attempt, which Wolfe said will depend on the availability of judges from the Guinness Book of World Records. He is hoping to make the attempt prior to Dec. 14 the date of Shawnee State University’s graduation. Acting before that day means hopefully the event can attract a few hundred participants from the college. Wolfe and his Eflow Development, along with the Friends of Portsmouth – which Wolfe helped found – have at least one other big idea for the coming holidays. On what is currently a vacant lot on Market Street, there are plans to put in place a temporary ice-skating rink, 35 x 65 feet in diameter with the skating surface made of a plastic that simulates ice but does not need to be frozen. “Temperature is not going to be a problem, we can use it anytime we want,” Wolfe said. He added work is underway to build a base for the rink which will stay in place until after Christmas. The immediate area also will feature a 16-foot decorated Christmas tree and a nativity scene with live animals. Wolfe said any proceeds from the rink will go towards purchasing five decorative arches the Friends of Portsmouth want to place over Second Street. Supporters first mentioned plans for the arches some time ago. Wolfe said the idea came directly from the Short North neighborhood in Columbus. He described Short North as an area police used to avoid but is now one thriving with visitors heading to retail shops and local restaurants. Prices for the arches sit at $75,000 each and are to be fabricated by a company in Piketon. The Friends of Portsmouth are raising those dollars. The arches will be permanent and will be lit up at least for Christmas. “The majority of the funds have been raised to do them,” Wolfe said. However, organizers need now to gain state approvals before the arches can be put in place. Wolfe seemed hopeful that will happen before the start of Winterfest. He contends the hardest part of building the arches will be 4-foot deep anchors which need to be placed on either side of each arch. Last, but certainly not least, Wolfe talked a lot about plans to decorate downtown Portsmouth with the help of civic groups and churches. Decked out with Christmas lights, Wolfe stated the mines attracted over 30,000 visitors last year alone. More downtown decorating will be done by the National Church Residences on Second Street. “There will be hundreds of people involved to pull this off,” Wolfe said, the major event sponsor being the Toyota Corporation. Wolfe has decidedly gained the support of Portsmouth Acting Mayor Kevin E. Johnson. “To me it all sounds like a wonderful time,” Johnson said regarding Winterfest. He said hopefully the activities will bring back memories of the hustle and bustle Johnson claimed was routine at Christmas time in downtown Portsmouth when he grew up here. Johnson also mentioned there are numerous other holiday activities planned around the city, such as at the Southern Ohio Medical Center and SSU. Wolfe also has several retail and commercial developments underway in downtown Portsmouth, some of which were previously announced. For example, in April he publicized plans for a candy store, dreamed up and named for his daughter Addie Grace. The shop was to sit next to Patties and Pints. Wolfe said the plans for the candy store will go forward but in a different location. He said the spot next to his restaurant simply was too large for the candy store and will be used for some alternate retail projects he was not yet ready to make public. Work also is ongoing on a “healthy restaurant” planned by local up and coming entrepreneur Hailee Barbarits. According to Wolfe, Barbarits purchased the existing building at 600 Second Street. Wolfe said restoration of that building is proceeding slowly partly because of the age of the structure. Some molding on the building is 100-plus years old and must be painstakingly repaired or simply ripped off and replaced. “Nobody wants to do that,” Wolfe said. As work on the restaurant proceeds, Wolfe is also helping paint older buildings on Second adjacent to Patties and Pints. Last but certainly not least, Wolfe also is involved with what’s basically known as the Glockner Museum, which will be dedicated and opened to the public for at least one day during what’s been dubbed “Glocktober Fest” on Oct. 21. Wolfe has plans for what is commonly known as the Candyland building next door, plans he really did not want to make public at this time. Wolfe clearly has involved himself in attempting to reinvigorate downtown Portsmouth. Why? Elsewhere in town, Johnson mentioned plans to create a bike path through Mound Park are moving forward, as is a scheme to create a bike path near the flood wall murals along the Ohio River. Johnson stated his understanding is the plans for the mural bike path have moved slowly but are still in play. https://www.portsmouth-dailytimes.com/wp-content/uploads/sites/28/2018/09/web1_second-street-A.jpgLocal graphics artist Gina Chavat created these renderings of improvements planned for downtown Portsmouth. 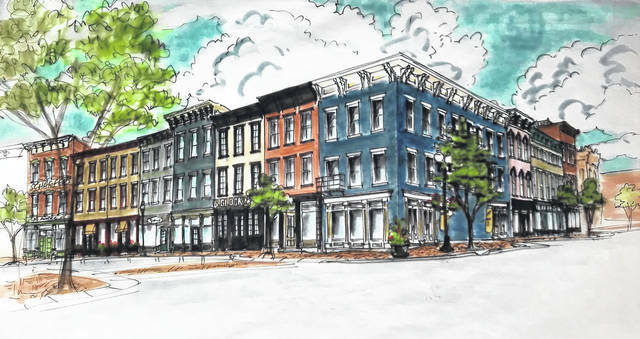 https://www.portsmouth-dailytimes.com/wp-content/uploads/sites/28/2018/09/web1_glockners-jpeg.jpgLocal graphics artist Gina Chavat created these renderings of improvements planned for downtown Portsmouth.